Some of the best pure storytelling around these days is being produced in the critically suspect genre of fantasy, and this exuberantly inventive first full-length novel, by the co-creator of the graphic series The Sandman (1996), is a state-of-the-art example. Richard Mayhew is a young man with a good heart and an ordinary life, which is changed forever when he stops to help a girl he finds bleeding on a London sidewalk. His small act of kindness propels him into a world he never dreamed existed. There are people who fall through the cracks, and Richard has become one of them. And he must learn to survive in this city of shadows and darkness, monsters and saints, murderers and angels, if he is ever to return to the London that he knew. In his first full-length novel, Gaiman, the comic-book mastermind, brings his talents to the black-and-white world of books, eschewing the darkly elegant illustrations that are a trademark of his comics. She had been running for days now, a harum-scarum tumbling flight through passages and tunnels. She was hungry, and exhausted, and more tired than a body could stand, and each successive door was proving harder to open. After four days of flight, she had found a hiding place, a tiny stone burrow, under the world, where she would be safe, or so she prayed, and at last she slept. "I doubt it; I sincerely and utterly doubt it." Mr. Croup ran a hand through his lank orange hair. "No, my fine friend, I was thinking metaphoncally -- more along the lines of the birds they take down mines." Mr. Vandemar nodded, comprehension dawning slowly: yes, a canary. Mr. Ross had no other resemblance to a canary. He was huge-almost as big as Mr. Vandemar -- and extremely grubby, and quite hairless, and he said very little, although he had made a point of telling each of them that he liked to kill things, and he was good at it; and this amused Mr. Croup and Mr. Vandemar. But he was a canary, and he never knew it. So Mr. Ross went first, in his filthy T-shirt and his crusted blue-jeans, and Croup and Vandemar walked behind him, in their elegant black suits. Three years in London had not changed Richard, although it had changed the way he perceived the city. Richard had originally imagined London as a gray city, even a black city, from pictures he had seen, and he was surprised to find it filled with color. It was a city of red brick and white stone, red buses and large black taxis, bright red mailboxes and green grassy parks and cemeteries. It was a city in which the very old and the awkwardly new jostled each other, not uncomfortably, but without respect; a city of shops and offices and restaurants and homes, of parks and churches, of ignored monuments and remarkably unpalatial palaces; a city of hundreds of districts with strange names -- Crouch End, Chalk Farm, Earl's Court, Marble Arch -- and oddly distinct identities; a noisy, dirty, cheerful, troubled city, which fed on tourists, needed them as it despised them, in which the average speed of transportation through the city had not increased in three hundred years, following five hundred years of fitful road-widening and unskillful compromises between the needs of traffic, whether horse-drawn, or, more recently, motorized, and the needs of pedestrians; a city inhabited by and teeming with people of every color and manner and kind. When he had first arrived, he had found London huge, odd, fundamentally incomprehensible, with only the Tube map, that elegant multicolored topographical display of underground railway lines and stations, giving it any semblance of order. Gradually he realized that the Tube map was a handy fiction that made life easier but bore no resemblance to the reality of the shape of the city above. It was like belonging to a political party, he thought once, proudly, and then, having tried to explain the resemblance between the Tube map and politics, at a party, to a cluster of bewildered strangers, he had decided in the future to leave political comment to others. He continued, slowly, by a process of osmosis and white knowledge (which is like white noise, only more useful), to comprehend the city, a process that accelerated when he realized that the actual City of London itself was no bigger than a square mile, stretching from Aldgate in the east to Fleet Street and the law courts of the Old Bailey in the west, a tiny municipality, now home to London's financial institutions, and that that was where it had all begun. Two thousand years before, London had been a little Celtic village on the north shore of the Thames, which the Romans had encountered, then settled in. London had grown, slowly, until, roughly a thousand years later, it met the tiny Royal City of Westminster immediately to the west, and, once London Bridge had been built, London touched the town of Southwark directly across the river, and it continued to grow, fields and woods and marshland slowly vanishing beneath the flourishing town, and it continued to expand, encountering other little villages and hamlets as it grew, like Whitechapel and Deptford to the east, Hammersmith and Shepherd's Bush to the west, Camden and Islington in the north, Battersea and Lambeth across the Thames to the south, absorbing all of them, just as a pool of mercury encounters and incorporates smaller beads of mercury, leaving only their names behind. A Novel. Copyright © by Neil Gaiman. Reprinted by permission of HarperCollins Publishers, Inc. All rights reserved. Available now wherever books are sold. This is really a book where London is the star. It's a wonderful critique of and hymn to a city with more personality and brio than most people. It's inventive and full of surprises. It's funny and horrible. It keeps you turning the pages, desperate to find out what happens and then sad when you reach the end. The novel is a triumph of fantasy. It's the sort of novel that introduces strange sets of cir[censored]tances that makes the reader feel like the main character Richard lost and somewhat confused, but then with each page the puzzle is revealed, and it's how Gaiman leads the reader through this wonderful world that is the novels biggest achievement. I recommend this textbook and ecampus as the best bookstore I ever dealt with! 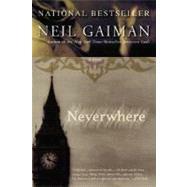 Neverwhere: 5 out of 5 stars based on 1 user reviews.